A couple of years ago I spent a blissful couple of weeks in and around Thanjavur and Chidambaram, in the South Indian state of Tamil Nadu. I was part of a small group organized and led by someone I had long admired from afar, Saskia Kersenboom. I had read her deeply researched, ground-breaking and brilliant book Nityasumangali, about the Devadasis who lived and worked in the Kaveri Delta region. Her Yatra residency brought us, a group of dancers and me, together, as we visited people, towns, villages, temples and so much more, that were in some way or the other part of the Devadasi world and its heritage. I was there to soak up the ambiance and learn everything I could, particularly as it related to the Cholas, a remarkable dynasty that ruled those parts a thousand years ago. It was a marvelous experience. Best of all, I got to know Saskia and discovered what a delightful person she is with her sparkling laughter and indefatigable zest for life, in addition to witnessing in person her passion and enthusiasm, her unwavering dedication, to her work. And I made a brand new set of friends with my fellow Yatris who embraced me as one of them, even though I was old enough (and more!) to be a parent to them. Every morning, before breakfast, I spent some time writing about the previous day, just so that I didn't forgot. This is what I am sharing with you. As with many chronicles, it started off with full sentences and a lot of detail; as the days went by and the schedule got busier (and I got lazier!) the sentences fractured into bullet-points, the little details which are the first things to be forgotten vanished, but I did manage to put down something for nearly the entire trip. Here is Day One, my arrival in Thanjavur. The Torre de Belem rises like a tall, generously ornamented wedding cake for a giant in a fairytale. It sits at the mouth of the Tagus River in Lisbon, Portugal’s capital city, right where it empties itself out into the open sea, the vast Atlantic Ocean. It is at one of Portugal’s - and Europe’s - westernmost points, looking forward and ahead into the great unknown, the world beyond. Lebanon is a small country at the eastern end of the Mediterranean Sea, wedged between Syria to the north and east, and Israel, to the south. It is a land that has witnessed centuries of history, some of which exposes humankind’s darkest side, the cavernous depths of brutality and savagery that we are capable of descending to. It is also a place of stunning beauty with a fascinating mix of cultures, friendly and courteous people and delectable food. The Phoenicians have been here, and the Romans, Umayyads, Ottomans and others too, and some months back, my husband and I were there to celebrate 30 years of being married. I was a mere five hour drive away from Madras and yet I felt as if I had time-traveled into another world and era, to a place where South India, as I saw it in my mind’s eye, still survived, gentle, calm, awash in devotion and tradition. I was in and around Thanjavur and the Kaveri River delta, and why was it a surprise that I felt this way, because life here seems to belong to another age, to move to a different rhythm. This land, this river, this city, these environs, had, for several centuries, been the jewel in the crown of the great Chola Empire. The winds of history have tempered its eminence, and this region is now quietly content to lie in fame’s shadow, to surrender its position of celebrity to the younger, brasher, livelier, more prominent and influential seat of authority to the north, Madras. Somewhere down the serpentine labyrinth that is the organization chart of the National Highways Authority of India is a little box that is an offshoot of the Department of Highway Safety. This box is the proud bearer of the title “Couplets and Proverbs Division (L&T K-W)”. It has a single employee, a long-haired, dreamy-eyed, thickly bespectacled youth, the nephew of the Chairman of the Department of Highway Safety (S-India). This young lad, who had been a gentle, sweet-natured child, the kind parents pointed out to their boisterous offspring as a shining example of what they ought to be like, created a major commotion in his family when he declared that he wanted to study Literature in college. He displayed a firmness and refusal to budge from his position that were in complete contrast to the gentle, pliant nature of his early years. His family, peopled thus far exclusively with engineers and doctors, were just recovering from the shock of the renegade’s announcement when he sent them reeling afresh with a further declaration that it was his intention to become a Poet. He would kill himself, he threatened, if anybody tried to prevent him from achieving his goal. Covering an area of over 130,000 square kilometers, India’s southern-most state has a variety of landscapes, terrains and habitats. There are beautiful, wave-lapped golden beaches and emerald green paddy fields; lush tropical forests and cool mountain ranges. There is a staggering variety of flowers, trees, birds, mammals, marine life, insects and reptiles, a nature-made counterpoint to the cultural and historical riches of the state. It is mineral-rich, with abundant reserves of lignite, quartz, feldspar, bauxite, limestone, graphite and granite. For Kanchipuram, City of a Thousand Temples. My life is a strange paradox. On the one hand, I am gloriously, happily busy, doing things that I love, but, on the other hand, my laziness and disorganization have reached record heights. Ideas for new posts are scribbled on bits of paper that vanish without a trace. What seemed like a brilliant idea while drifting off into dreamland feels tame and lame in the harsh light of day. An overflowing pile of unwashed clothes beckons, demanding action, as does an empty pantry. There is family to tend to, friends to catch up with. Spring - beguiling and fickle, garbed in bright, sun-splashed colors one day, in damp, sullen gray the next - is knocking at my window, urging me outdoors. All this means that I have nothing new to share with you right now. But I am not above taking the easy way out. Digging through my hard drive, I found parts of my Croatia travelogue that I have not posted here. A gentle dusting off of virtual cobwebs, a little smoothing out of rough edges, a touch of spit and polish, and voila hey presto! A new-old (or old-new) post! The state of Tamil Nadu rolls gently and smoothly south-westwards from Madras to Coimbatore. The terrain is mostly flat, save the occasional hills that rise and fall like soft sighs. The scenery is vintage South India: emerald green paddy fields, lush groves of banana and coconut, clumps of tall, dust-kissed trees. It is a landscape of timeless beauty, soothing and serene, and of all the beautiful places in the world, it is this that ignites a spark deep in my heart, that whispers to me, you are home. Straddling the equator in an azure expanse of ocean 3000 miles east of India, on the restless backbone of a volcanic belt, lie hundreds of islands. They form a land-bridge of sorts between India and Australia, emerald-green, beautiful, bewitching and fascinating, a region where a succession of dynasties and civilizations have left their impact. Aborigine, Hindu, Malay, Polynesian, Islamic, European. With names that conjure up such romance and mystery, enchantment and beauty: Java, Sumatra, Celebes, Borneo, Bali. Legions of giggling schoolchildren, high-spirited college students, trysting lovers, coy honeymooners, and tourists, both frivolous and serious, have traveled the 60 odd kilometers from Madras to Mamallapuram. I have made the trek, too, several times, in all these capacities, the first over four decades ago. It is impossible to write a simple and straightforward account of anything in India. Say you want to write about a place. You start gathering your information, your memories, your thoughts. And you find you have stepped into Looking Glass Land, a mare’s nest of goddesses, demons and kings, ancient travelers, age-old feuds and modern politicians. The strangest of bedfellows clamor for your attention, and you cannot afford to ignore or dismiss any of them. You have mythology rubbing shoulders with history. You have to consider politics, religion, culture, science and economics, each with its attendant brood of issues and points of contention. The past and the present are inseparably intertwined. You step back and view this lively patchwork, this teeming tapestry. And you say, wow. The distance from Trivandrum to the temple town of Suchindram on the promisingly named National Highway 47 is barely 50 miles. This is the deep south of India. The land of gently swaying coconut palms and emerald green paddy fields, red earth and sea-misted air. How quickly one goes from complaining about the cold to complaining about the heat! It had been barely a few dozen hours earlier that we had moaned about the New York winter, unfolding with cruel frigidity and stretching endlessly ahead while our eyes gazed blearily at the bleak, wind-whipped, snow-swept landscape all around, draped in monotones of white, gray and brown. Everyone is in high spirits after yesterday’s rollicking, wildly successful Carnival and the party at Rok and Lea’s. The big event for the day is our pianist Jose’s recital for us in the Kastel. He has a big performance coming up in Spain a few weeks later, and we are to have a preview concert of selected pieces. He has been practicing for hours every day, and I hear beautiful music wafting out from the Kastel, from the music school, the studio, wherever there is a free piano to practice on, all through the day. Sunday, the last day of the Mayor’s Festa. The day dawns wet and cold, with a sharp wind and a continuous, gossamer-light drizzle. A sagging, weary, silent group shows up for practice in the studio. Even Olinda is subdued, worn out after the all-night revelries of the Festa. Nobody has slept more than a couple of hours. Irritation quivers in the air and exhaustion weighs it down. Tempers snap as an argument breaks out over how some chords should be played on the flute and guitar. The others fall silent, and Jane, sensing the collective mood diving swiftly downward, calls for a “group hug”, a concept so strange and pointless to Olinda that he just stands and stares, shaking his head in disbelief. Such things seem to mean a lot to Jane, so I wink at him and beckon him to our loving little circle of huggers. The sheer absurdity of the rite cheers him up, I think. This is Day One of the Mayor’s Festa di san Vito, Modesta e Crescenzia Festival, and nobody seems to know quite what’s going on. There is an Art Gallery opening, our performance, food and drinks, and posters pasted all over town promise a well organized and tightly scheduled evening. The reality is anything but that. Our morning lesson is done, and we have some time to spare, which we spend lounging on the steps in front of Bastia. It is a sunny morning, and the village is quiet, basking in the sunshine, and the warmth makes us feel languid and lazy. Conversation drones and buzzes in low tones. A little black poodle makes his way cautiously to our group, tentatively seeking friendship, and a simple fetch game. This little game makes him a different animal altogether, happy and bright, where earlier he had been cowering, shy and scared, at the entrance to a bar. I have been issued a mandate that is as tall as it is broad: to teach Carnatic music and Bharata Natyam to a group of musicians and music students in Groznjan, Croatia. The only other things I have fleshing out this directive are the dates I am to arrive, and depart. That’s it. There is a vague mention of a "theme", taller and broader than the order itself (the stars and air), which I put aside right away. There’s a lot else to worry about. This blog will fall silent for several weeks. I am going on a voyage, to a place called Groznjan, in the Istrian Peninsula of Croatia. It is, I am told, a small, medieval, hilltop village, charming and picturesque, with cobble-stoned streets and old stone houses. Gazing across the hills over the Mirna River, there are vineyards and olive groves and glimpses of the Adriatic Sea glinting in the distance. For centuries, Groznjan was ruled by Venice, and the Italians call it Grisignana. The Slavs and the Austrians wrested control when they could from the Venetians, and little Groznjan flourished with all the attention. Today, there are remains of town walls, ramparts, a renaissance loggia, churches, stone cottages and other Venetian influences that still survive. After the geopolitical juggling and wrangling of the post-World War II years, Groznjan became part of Yugoslavia, and life bled slowly out of the little village as people deserted it for more prosperous shores. The streets lay silent and forlorn. Then in the 1960s, it had a rebirth - as an artists and musicians colony. The Jeunesses Musicales International Cultural Center was born, and the cobble-stoned streets of Grozjnan have been ringing with the sounds of music ever since, and painters, potters and sculptors grace its homes and many art galleries. So, farewell, and I will be back next month with many tales to tell, many pictures to share with you. Today was our big sightseeing day, as it was my last full day in Bangkok. We woke up at 6.30am, and met as planned at 7.30am in our hotel’s restaurant for the free American Set breakfast. Expecting no more than coffee and rolls, we were pleasantly surprised to find that orange juice, eggs and bacon/ham/sausages/mushrooms were included as well. The menu card stated in a big, bold, strict, finger-wagging font that no more than one cup of coffee or tea was allowed per person, but that was fine by us. Packed like sardines into an ancient Bangkok Airways aircraft, we bid farewell to Siem Reap and headed north to Bangkok, our final leg on this trip. An hour later, we landed in Bangkok's gleaming, if somewhat sterile, Suvarnabhumi Airport. The airport was festooned with banners that proclaimed, “Long Live the King”, with photos of a grim and bespectacled, but youthful-looking King Bhumipol Adulyadej, or King Rama IX. As is so often the case, appearances were misleading: King Bhumipol is a ripe 80 years of age, but perhaps neither he, nor his adoring subjects, want to acknowledge this. We staggered out of the air-conditioned cocoon of our restaurant, squinting into the sun-bleached air. The temperature was rising, steadily. The bustling crowds we had seen a short while back had thinned, sensibly keeping indoors for the hottest part of the day. 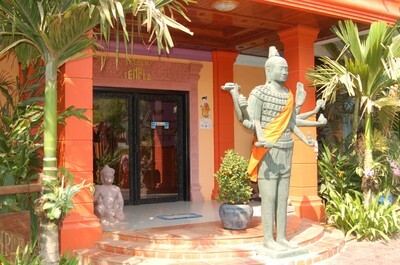 We, however, still had a few temples to visit. This was our last day here, and so, heroically braving the heat, we left to see some of the oldest temples of this civilization, collectively called the Roluos Temples. 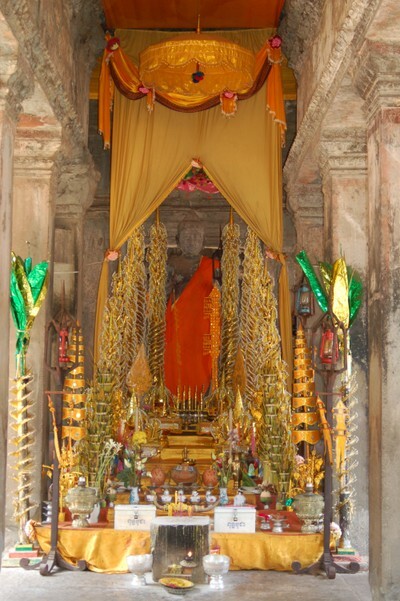 A Trip to Angkor Cambodia: Day 3 - Angkor Wat! This was our last full day in Siem Reap, and we saved it for the Big One: Angkor Wat. We allowed ourselves the luxury of sleeping in a little longer (the tyrant was reset to awaken us at 6am), since Sarng advised us that arriving there too early was not a good idea, as the place would be thronged with people all trying to catch a glimpse of the temple at sunrise. Angkor Wat actually faces west, unlike the other temples, and is supposed to be at its most spectacular at sunset, but the sunrise views are also said to be lovely. 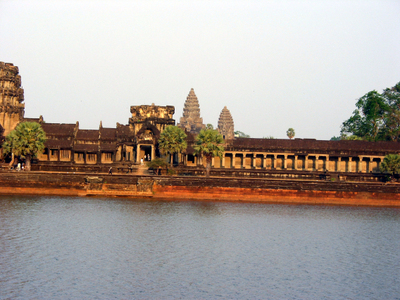 The plan was to see some of the farther-out temples today, and to reserve the Big One, Angkor Wat, for tomorrow. So, early in the morning, after equipping ourselves with a generous supply of 10 baguettes (yesterday's 2 baguettes were pitifully inadequate), we departed for Banteay Srei, a temple about 20 km north of Siem Reap. It was a lovely drive through very scenic, although poor, Cambodian countryside. On either side of the road were cashew, mango and banana trees, many of them laden with early-season fruit. Most of the village homes were made of wood, and were atop stilts, with bicycles, farm equipment, and cattle kept in the area underneath. In spite of the very evident poverty (there were no power lines in sight, and apparently many of these villages lack electricity) everything was very clean. 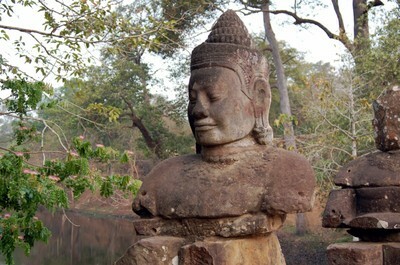 I got off the plane at Siem Reap, into the blazing heat of a tropical afternoon. What a change from the sleet, wind and miserable cold in New York! I had a joyous reunion with the rest of my group, which had arrived earlier in the day from Madras. Along with them was our guide for the trip, Sarng, a gentle, always-smiling young man whom you took to instantly. We decided to stop on the way to our hotel to buy our passes for the various temples. En route, we passed Angkor Wat! I could not believe my eyes. What a miracle modern travel is! Just a few hours on a plane, and you emerge into another world altogether, so different from the one that was left behind. I could not believe that we were looking at the Real Thing! As in the case of the Taj Mahal and so many of the world’s wonders, no picture can actually do it full justice, but not everybody is lucky enough to be able to see it, so here is one, taken from our vantage point across the moat. Angkor Wat from across the moat: first glimpse! 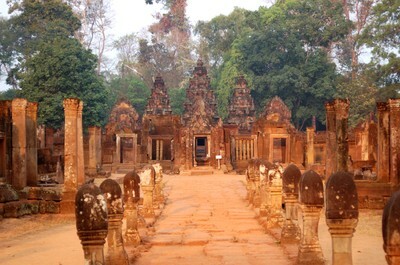 Deep in the Cambodian jungles lie some of the world’s most astonishingly beautiful temple ruins. 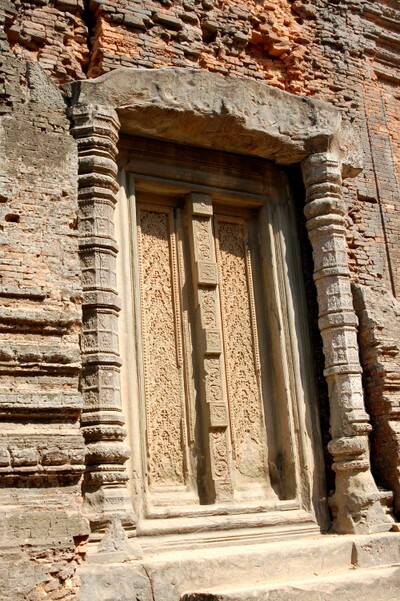 Built between the 9th and 15th centuries, during the years of the Khmer Empire, they are mind-boggling in their sheer exquisiteness, complexity, intricacy, variety, symmetry and numbers. I love travel - reading about it, dreaming about it, and best of all, actually doing it. In the past couple of years, I have been supremely fortunate in having had the opportunity to travel to a range of places, rich in history, monuments and natural beauty. 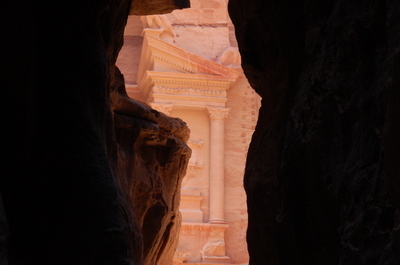 I think they are some of the world's most amazing locales. Let me share with you some of the sights I saw on a trip I made recently to a place - I won't tell you where, right away, but will tease you with a few photographs, and let you do the guessing. If you are not in the mood for that, be patient, wait for a few days, and you will find out! The town of Suchindram is in the far south of Tamil Nadu, a mere blink of an eye from Kanyakumari, the Land’s End of India. It is a morning’s (or afternoon’s) drive from Kerala’s capital, Trivandrum, past the chaotic jumble of its outskirts, through dusty, potholed roads and bustling villages and sudden glimpses of a landscape of breathtaking beauty. All around Suchindram is the South India of one’s dreams: dense banana groves, swaying coconut trees, paddy fields ploughed by sloe-eyed oxen, the fertile land a glossy, emerald green as far as the eye can see.